The Saddle Stitch Binding method is the second most common method used in commercial bookbinding. It is also a fast and easy way to make beautiful notebooks that will definitely impress your friends. What is a Saddle Stitch Book? A saddle stitch book is a thin book bound together using either a thread or staples. Commercial saddle stitch binding uses staples to bind books. This results in a fast and cheap method to mass produce notebooks or thin books. Compared to the Perfect Binding method, the Saddle Stitch Bookbinding method is also faster and perhaps even more cost effective. It only requires several staple bullets to bind a book. The downside for the commercial Saddle Stitch Binding method is that the thickness of a Saddle Stitch bound book is limited to the strength and length of a staple bullet. Hence, these books are usually thinner compared to Perfect Bound books. They are made of folded paper and thus have a small spine. 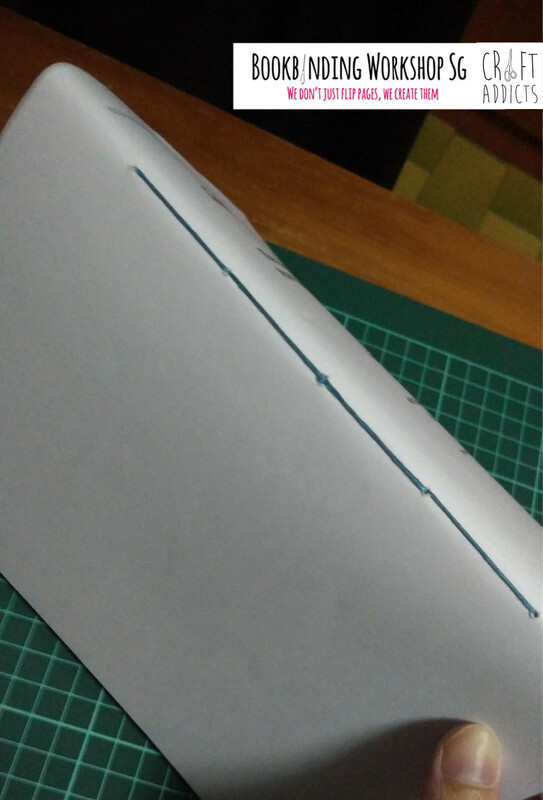 After all, it is relatively easier to place a staple bullet through softer paper compared to thick cardboards, these books usually comes with a soft book cover. Hand made saddle stitch books are usually bound together using thread. This creates a longer lasting book, that can be made in a relatively short time too. We have found that hand made, personalized saddle stitch notebooks or diaries make great presents for friends and loved ones. Saddle stitch binding is a fast and fun way to make quick gifts or notebooks. Simply grab a beautiful image off Google, print it out onto a paper for a beautiful cover page. If you’d like a notebook containing pages with lines, purchase some lined paper that can be found in most stationary stores (Popular bookstore has some of them). This tutorial is also a great primer into bookbinding for kids between 9 to 14 years old too. You can easily modify the tutorial below for your kids. Just make sure that they are comfortable with needles. Otherwise, replace the needles with staples during your first project. The duration is highly dependent on the thickness of your book. Explore your bookbinding options with our Bookbinding Essential Kits, or give this convenient starter bookbinding toolkit a try. We break down the entire saddle stitch bookbinding process into 4 sections below. Feel free to take breaks in between, or break your saddle stitch book project across several weekends. 1. Gather your paper into a stack. 2. Place your book cover on top of the stack (facing out). 3. Make sure the paper are aligned. 4. Hold the paper in place using the clips. 1. Using a Ruler, draw a line that splits the book into 2 equal halves (across the underside of the book). 2. Mark 5 spots separated by equal distance along the line. – these spots will be used for sewing later on. 3. Use your Awl and make holes on the 5 spots you have marked out. 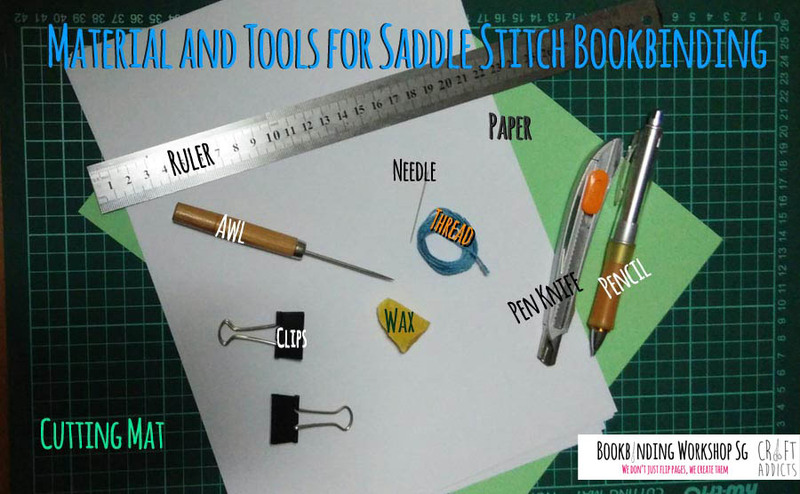 We will start the sewing process from the middle hole in this Saddle Stitch Bookbinding tutorial. 2. Put the thread through a needle. 3. Start sewing from the inside of the book (the side where you will write on), beginning your stitch from the middle hole. 4. Bring your needle across the hole and pull the thread through. 6. Bring your needle to the hole on its right and pull the thread through. 7. Continue onto the next hole (on the right) before making a U-turn and coming back to the middle hole. 8. Repeat until your thread has gone through all the holes. 9. The sewing should end at the middle hole (where you started from). 10. 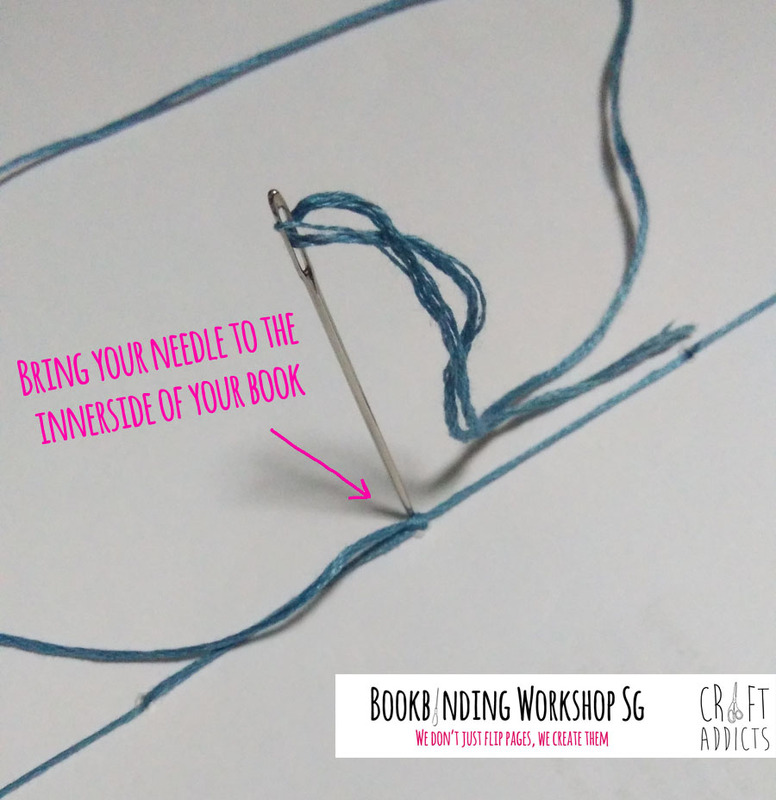 Bring your needle to the inner side of the book via the hole you started from, pulling the knot that you have just created in too. 10. Cut off all excess thread. Once you’re done with the sewing, you should have a stack of paper that is bound together in the middle by a thread. Remember, the saddle stitch binding is only suitable for thin books. Trying to bind a thick book with this method results in a book that cannot be folded flat.